When the Dark Knight goes on patrol in Gotham City he needs to have someone he can trust by his side, and the only one that Batman can trust is... Robin, of course! This boy wonder has joined him on many adventures in taking on Two-Face, the Joker, and even the Riddler. But sometimes when Gotham is quiet on crime, Robin joins up with the Teen Titans to help save the world! Boy, this is one busy sidekick! Even though Robin doesn't get half the amount of credit or the fame that Batman gets. Let’s face it, we all know he's the brains behind all of their superhero operations. He may not have the superhero strength or endless financial support like Batman, but he has more grit and determination than his friend and mentor. Teach your little one how to fight through any obstacle just like Robin does by dressing him up in this Robin costume for Halloween (or you could just let him dress up anytime – crime fighting takes no breaks). Now you can let your little one save the day as half of a dynamic duo by dressing him in this toddler Robin costume. This officially licensed Robin costume is a 100% polyester jumpsuit that has Robin’s signature “R” on the front and a printed yellow utility belt. And, of course, what would any superhero be without a cape and without a mask to hide their true identity? 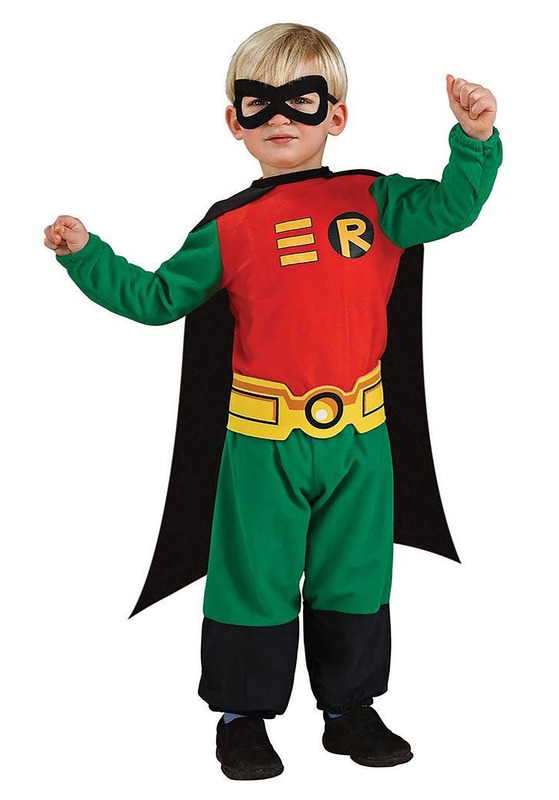 Good thing this toddler Robin costume comes with a black cape and black eye mask, so your little one can truly transform into the superhero he already is!